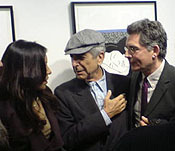 David Boucher, author of Dylan and Cohen, with Leonard Cohen and Anjani Thomas. The Political Theory Research Unit which centres on the work of six staff, although smaller than the School’s other units, constitutes a concentration of expertise that is unusual in a national context. Indeed, Cardiff’s strength in this sub-discipline of Politics is unique in comparison with other UK Schools of European Studies and very unusual in Politics Departments. The unit takes advantage of this to undertake research and to produce individual and collaborative publications and projects that are of world class, and in many instances are world leading and research agenda setting. Our many postgraduate political theory students are also centrally involved in the work of the unit.